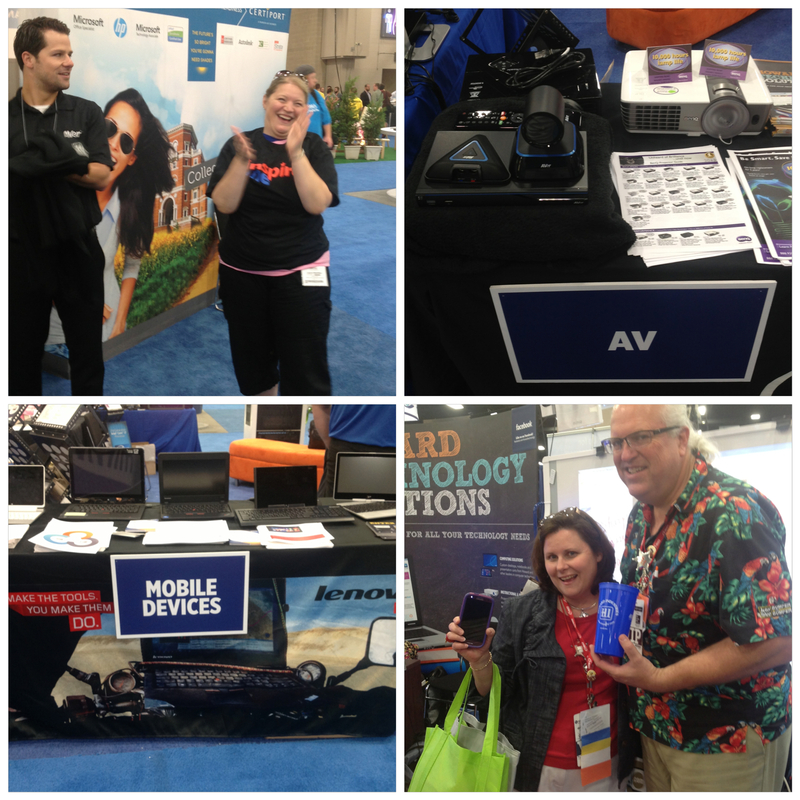 Thank You for Another Successful ISTE Exposition! 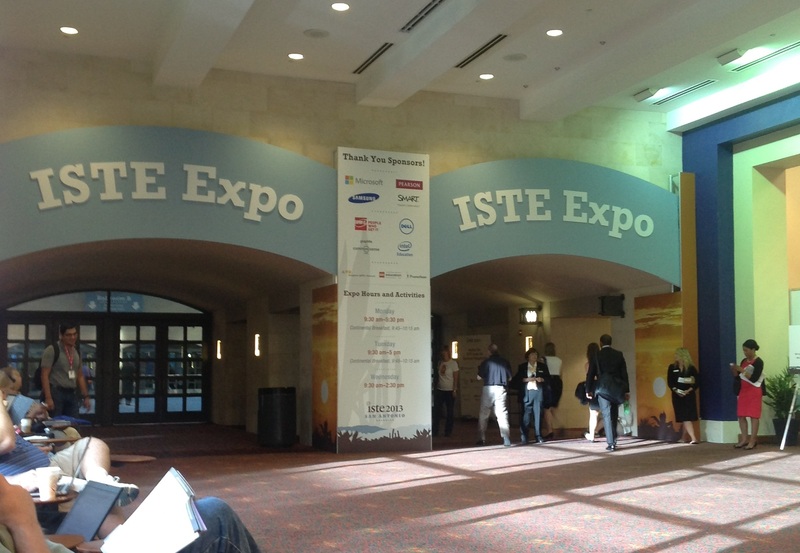 From the moment you stepped off the plane in San Antonio, you could sense the excitement leading up to the annual ISTE 2013 Conference. Educators, administrators and exhibitors gathered from around the world all with one common goal in mind, to further enhance the learning and teaching through the use of technology. On Sunday afternoon, the Howard Technology team gathered together to enter the Henry B. Gonzales Convention Center to begin setting up for what would be yet another amazing experience exhibiting at ISTE. After hours of collaboration and teamwork our empty section of carpet in the grand exhibit hall was transformed into an interactive one stop shop technology booth. The group was filled with excitement about the next 3 days that would be spent sharing and engaging with individuals from all over the world who holding various roles in the education industry. Monday morning quickly approached, and with the group full of energy and eagerness, the Exposition began! Individuals were able to approach our booth to interact and ask questions about our broad display of products and solutions. 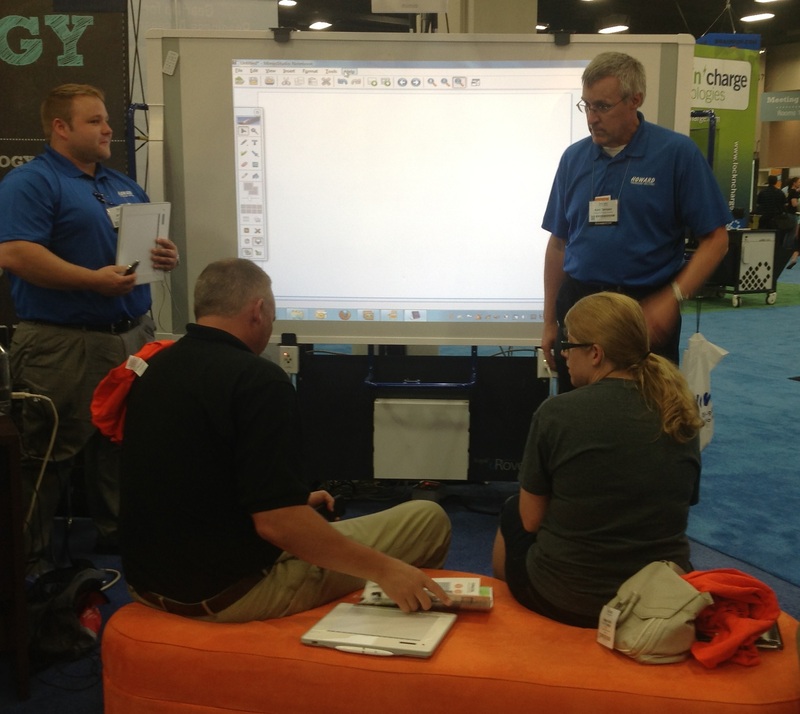 The Mimio board was set up in front of our comfy orange chairs, where educators were invited to take a rest and learn about the interactive system. We had a variety of individuals eager to discover more about the software options associated with Mimio and the importance of incorporating interactive boards into a 21st century learning environment. On one side of our booth displayed a table full of our mobile devices, featuring brands such as Lenovo, Howard, Acer, and HP. The table was also filled with literature detailing our numerous options of solutions and open for the public to interact and become familiar with our products. 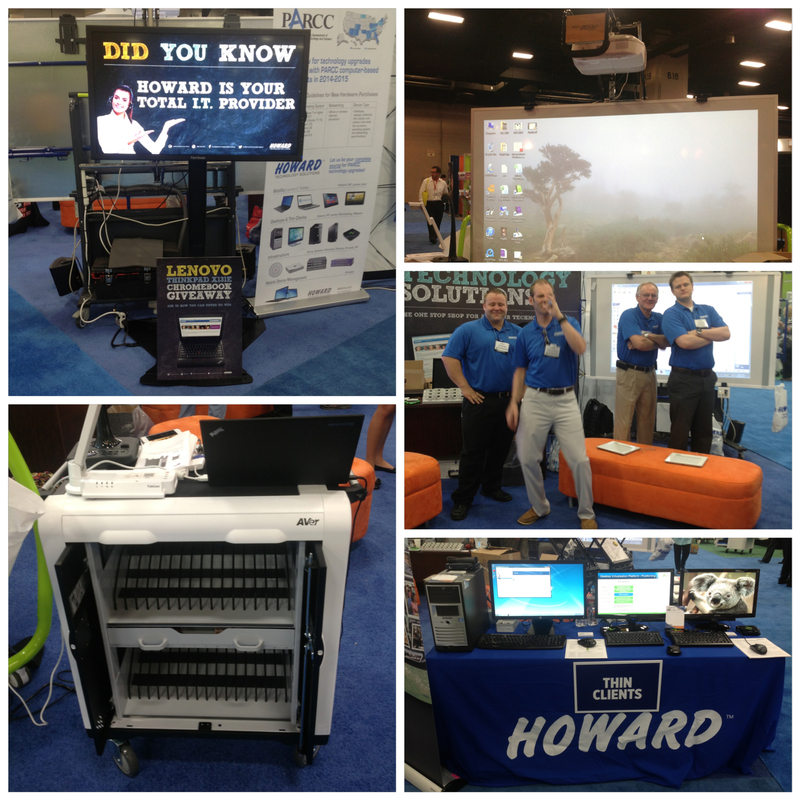 On the other side, our booth was dedicated to our Audio Visual and Instructional solutions as well as our Wireless options. This table held our BenQ projector, AVer video server and document cameras as well as our Enterasys wireless network solutions. Standing alone, but attracting an array of publicity, sat our brand new AVer cart. With it’s ability to charge, sync, secure, store and transfer 32 iPads at one time, it became a very popular product among many educators. The front of our booth displayed a variety of thin clients, computers and monitors. Our NComputing Virtual Desktops (aka Classroom in a Box) were a fan favorite of individuals looking for desktop virtualization. Around our booth were our digital signs from ViewSonic displaying messages about our endless amounts of services, solutions and products. Intermixed with our Howard Technology messages, were the fabulous iRover stands displaying signs introducing the new Microsoft Office and the innovative EPSON projectors. Throughout our 3 days at the Exposition, we had the opportunity to talk with educators about their ideas and questions around integrating technology in the classroom. The conference allowed us the time to learn about their concerns and put their minds at ease by explaining our array of solutions, software, and products offered. We mingled with existing customers and discussed their thoughts and excitement about their flipped classrooms. Overall, the conference was extremely successful! We loved the opportunity to engage with new and existing customers. 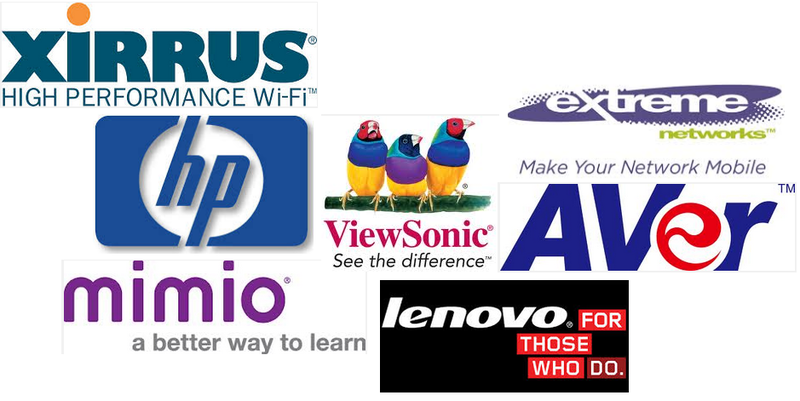 We want to thank all of our partners for helping to make the conference a huge success and a BIG thanks to all the educators around the world. Without your excitement, interest, and dedication to education none of this would have been possible. We really enjoyed hearing everyone’s thoughts and ideas about education technology at the conference and we encourage people to continue to share your thoughts with us in the comments below! We are so excited about ISTE 2013 that we are giving away a FREE Google Chromebook! 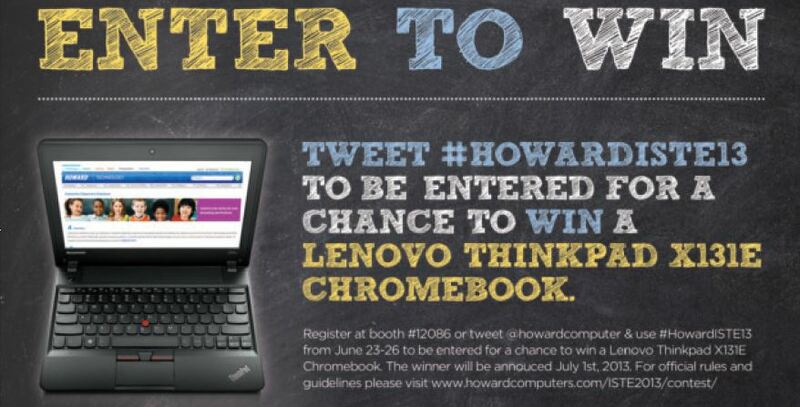 All you have to do is tweet using the #HowardISTE13 and you are automatically entered for your chance to win. Feel free to send a photo, tell us what you’ve learned, talk about your favorite speaker or simply tweet to @HowardComputer. We would love to hear your thoughts on the EdTech event of the year! 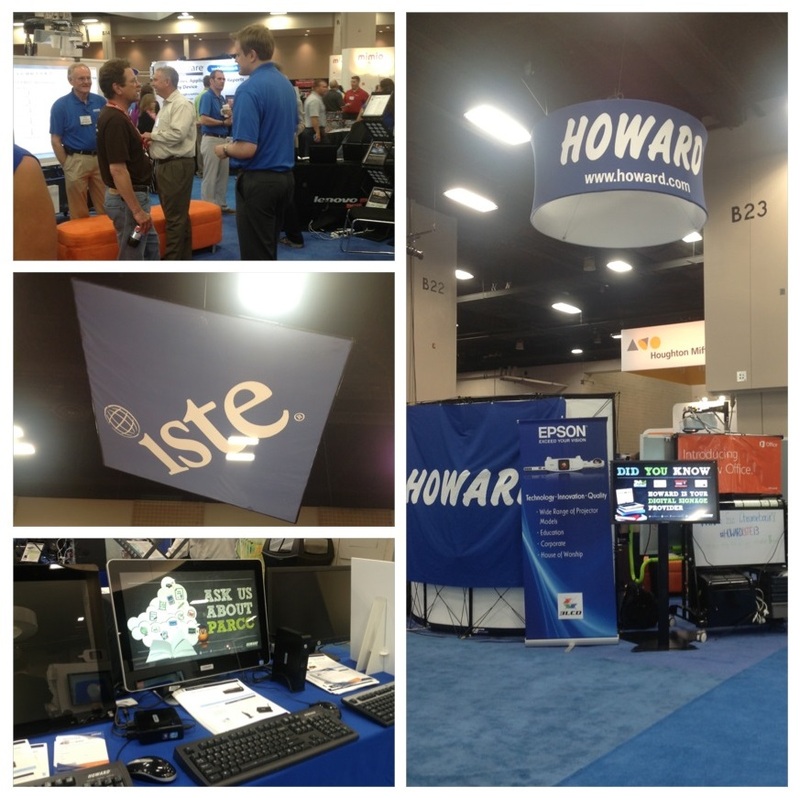 Be sure to check out the schedule for ISTE’s 34th Annual Conference and Exposition held June 23-26, 2013 in San Antonio, TX. The conference will be full of workshops, networking fairs, exhibits and amazing keynotes.